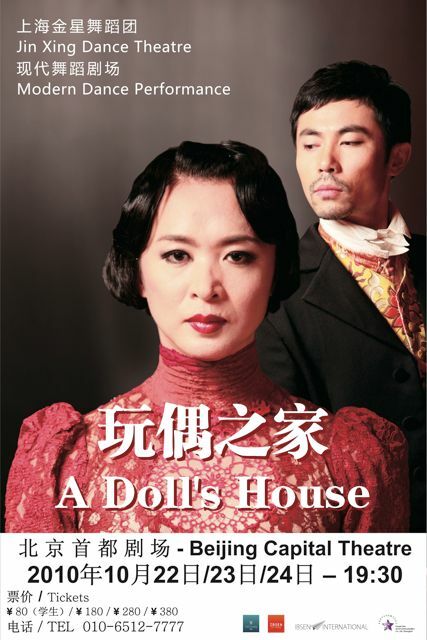 A Doll’s House by Henrik Ibsen, starring Jin Xing as Nora. A Doll’s House is a Sino-Norwegian production presenting Ibsen’s master piece as contemporary dance-theatre using both Norwegian and Chinese language on stage. This drama play is about the final revolt of Nora Helmer, a wife who has been treated her entire life as a plaything. Years earlier Nora has committed a forgery in order to save the life of her authoritarian husband Torvald. Now she is being blackmailed and lives in fear of her husband’s finding out and of the shame such a revelation would bring to his career. But when the truth comes out, Nora is shocked to learn where she really stands in her husband’s esteem. In the end Nora leaves her husband and children to find out who she really is. Jin Xing, one of China’s most well known dance artists, holds the lead role of Nora. The production cast further includes 2 performers from Norway and members of Jin Xing Dance Theatre Shanghai. 5 Chinese Noras appear on stage to display different sides of her personality. The performance languages are Mandarin and Norwegian with English and Chinese subtitles. A tour of A Doll’s House in China and other countries in 2011 is under planning. .
Jin Xing (directly translated: golden star) started her remarkable life journey 1967 in Shenyang in Liaoning province. She was born to parents from the country’s Korean minority at a time when China was caught in the throes of the Cultural Revolution. At the age of nine, she managed to get herself enrolled in the famous military dance ensemble in Shenyang, whose teacher belonged to the top of classic ballet in China. Since then Jin Xing’s history reads like row after row of superlatives. At the age of 17 she received the Best Dancer of China Award. With 19 she became the first Chinese dancer to win a grant in New York from the Asian Cultural Council of America and the American Dance Festival. Amongst others she studied with Martha Graham, Merce Cunningham and Jose Limon. In 1991 she won the “Best Choreographer Award” of the American Dance Festival for her creation “Half Dream”. Jin Xing then decided to move to Europe. There followed educational visits and appearances with various ensembles in Rome and Brussels. In 1993 after a total of six years in the western world Jin Xing returned to China where she became teacher for the National Choreography and Modern Dance Training workshops commissioned by the Chinese Ministry of Culture. In 1994 she resigned as Colonel from the Chinese military dance company. This move out of the Chinese establishment didn’t slow down Jin Xing. In contrary she continued her successful career with the creation “Black and Red” which received the Ministry of Culture award – first time this award was given to a contemporary dance performance. In the beginning of 1996 she accomplished to set up “Beijing Modern Dance Ensemble” the first modern dance troupe in Beijing. She is leading her ownensemble since 1999, the “Jin Xing Dance Theatre” relocated to Shanghai in 2000. It’s the country’s first independent modern dance and performing group. With excellent productions like “Shanghai Tango”, “Carmina Burana”, “Shanghai Beauty”, the solo dance creation “The Closest The Furthest” and her latest work “The China Project” the company was much acclaimed both nationally and internationally with appearances at festivals such as Adelaide Festival, Biennale di Venezia, Dance Umbrella London, Impulstanz Vienna and Steps in Switzerland. Besides her achievements in the field of dance Jin Xing confirmed her versatile talent as jazz singer and with leading roles in theatre plays and movies. Following her mission to develop the culture in her home country Jin Xing founded in March 2006 “Shanghai Dance Festival” as the first independent dance festival in China. Her strong engagement in the cultural world received international recognition. End of 2004 she was awarded as honorary member of ELIA, the European League of Institutes of the Arts. In November 2006 she received the honorary doctor degree of Dartington College of Arts in the UK. Jin Xing not only represents a new generation of China today. Her name means more as a synonym for courage, freedom, self-responsibility and the endless power of an artful spirit.